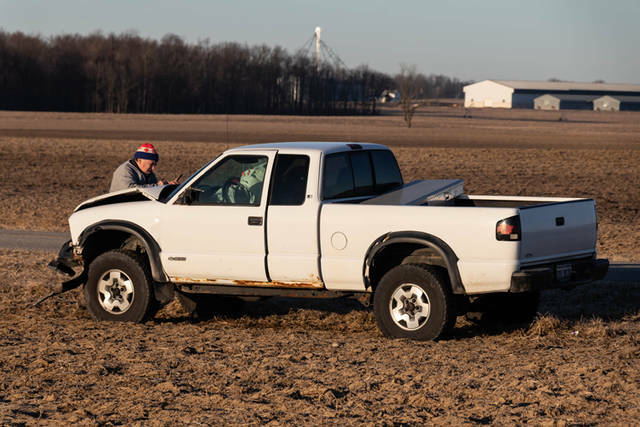 According to the Darke County Sheriff’s Department, a white Chevy S-10 pulled into the path of oncoming traffic and caused a collision with a red Dodge Ram Heavy Duty 2500. 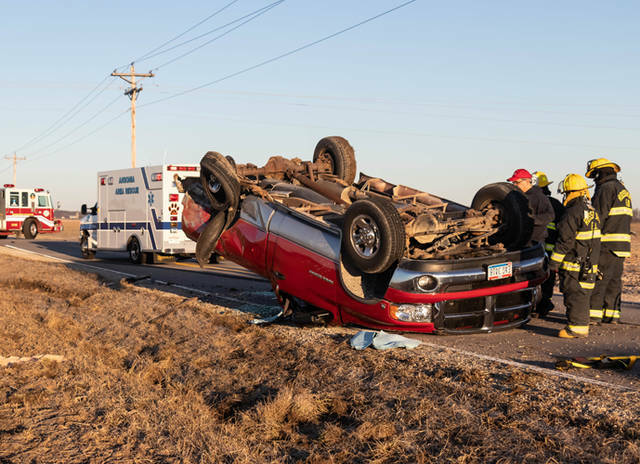 DARKE COUNTY – A two-vehicle rollover accident resulted in drivers suffering minor injuries early Tuesday morning. 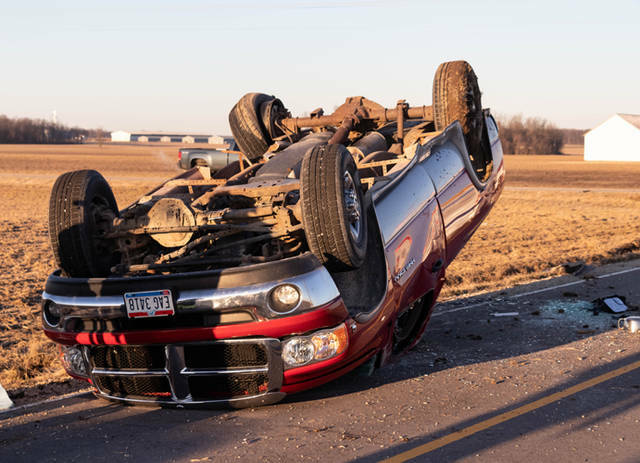 At approximately 7:40 a.m., emergency personnel from Rossburg Fire Department and Ansonia Rescue as well as deputies from the Darke County Sheriff’s Department were dispatched to the intersection of Regal-Bell and McFeeley-Petry Roads in regards to a two-vehicle accident with a vehicle on its top. 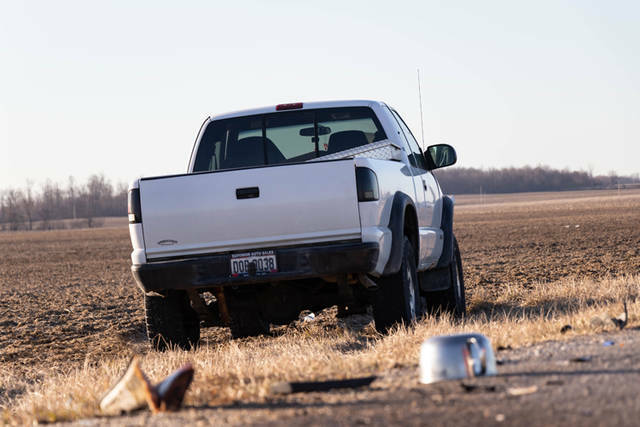 According to the Darke County Sheriff’s Department, a white 2002 Chevy S-10 driven by Ivan Tobe, 58, of Fort Recovery, was traveling southbound on Regal-Bell Road when Tobe, who was stopped at the stop sign at the time, pulled into the path of oncoming traffic and caused a collision with a red 2003 Dodge Ram Heavy Duty 2500 driven by Janice Hummel, 66, of New Weston, traveling eastbound on McFeeley-Petry Road. The red Dodge Ram then rolled, coming to rest on its top as a result of the collision. Both Tobe and Hummel were treated on the scene by Ansonia Rescue for minor injuries before refusing any further treatment and transport to a medical facility. Tobe was cited as a result of the crash. Due to an unknown amount of diesel fuel being spilled on the accident scene, Rossburg Fire Department, under communication with the Darke County Hazmat Team, was tasked with the clean up of the spill. The intersection of the two roadways remained closed for a short period of time while the spill clean up took place and the wreckage was removed. This entry was tagged Ansonia Rescue, crash, Darke County Hazmat Team, Darke County Sheriff’s Department, Darke County Sheriff’s Office, Rossburg Fire Department. Bookmark the permalink.